I still don't understand why the CEO/Chairwoman/ Founder has to venture into HyfluxShop. I mean, isn't the electricity market, the business in the middle east and being on the board of directors of ST Engineering enough on her plate? 3)then within 3 months, suspend Hyflux and ask the court for protection? CEO/Chairwoman/Founder Offer to buy Hyflux Shop from existing shareholders. In summary, ordinary Hyflux shareholders ( code:600) were given a dividend-in- specie of HyfluxShop shares in January 2018. (See here). In February 2018, CEO/Chairwoman/Founder offered to buy over the HyfluxShop shares from the ordinary Hyflux shareholders. Take note that HyfluxShop is unlisted and it wouldn't be unreasonable to guess that many Hyflux shareholders would accept her offer. As of now, it is still unclear how many ordinary Hyflux shareholders accepted her offer. But, as of the offer statement by CEO/Chairwoman/Founder in February, she controlled 54.2% of HyfluxShop through direct and deemed interest. As of February 2018, CEO/Chairwoman/Founder controlled about 34% of Hyflux and 54% of HyfluxShop, effectively having considerable influence in both entities. Now, it was stated in the offer document that HyfluxShop has issued $20 million worth of perpetual securities to Hyflux at a rate of 6% pa with terms having an uncanny familiarity with the N2H and BTWZ ones. This is certainly peculiar to my layman mind. And the lucky draw of a BMW3 series and $150,000 of cash on the HyfluxShop pisses me off....is this where the $20 million went? And you know what? Compare hyfluxenergy.com and myhyfluxshop.com to compare the very visible difference in allocation of capital to promotions. CEO/Chairwoman/ Founder exerts considerable influence over both entities. Due to her offer of HyfluxShop shares ,she would control HyfluxShop considerably more assuming she gets many acceptance of her offer. Let's say she gets full control of HyfluxShop such that it becomes solely hers, does she get the $20 million without the need to "return" it. Since she is the largest shareholder of Hyflux, will she have the motivation to demand the $20 million to be returned? Is this an arm's length transaction or a transaction with a conflict of interest? I don't know as im just a layman with unqualified experience and just wondering. How much of HyfluxShop does Olivia control now , taking into account the number of people who accepted her offer? 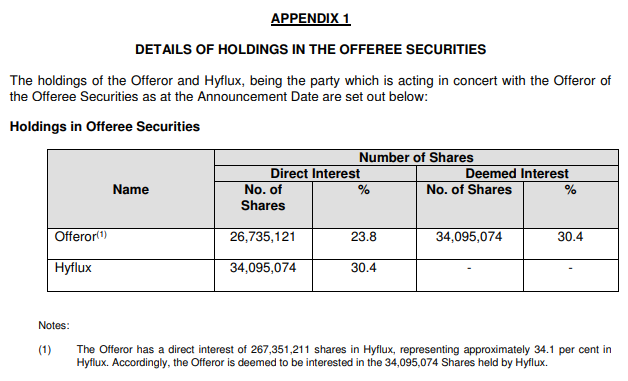 Will HyfluxShop become a completely independent Entity of Hyflux once she gets enough of the Hyflux shares and would she buy over Hyflux's stake of HyfluxShop too? How must HyfluxShop fare before the $20 million will be returned to Hyflux? How will we know since it's an unlisted entity and it's financial statements are not opened to public? If Hyflux were to be liquidated ( touch wood) and cease to exist, will the $20 million need to be paid back?